It is right, and proper, and good that we do this. Inspired by divine Wisdom, the Holy Church of Jesus Christ, has through the years been fractured, tempted, and bruised by the assaults of Satan. Yet, in this feast we remember that we are saved, that Satan, ultimately, has been defeated by the willingness of a young woman to be the Mother of our Savior. It is through the grace filled moment of Mary’s conception and birth that we have the Scriptural road diverge toward final fulfillment of the Divine Will. The sacred image below is by the late 19th century American artist Henry Ossawa Tanner. 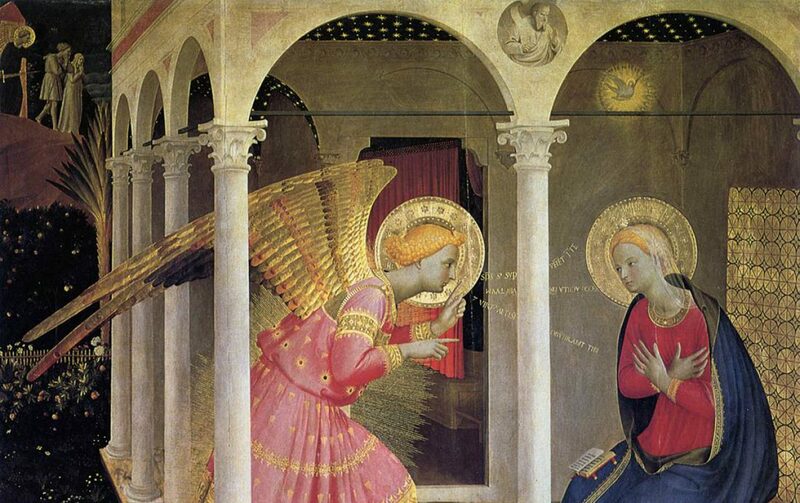 Of all the sacred art that has been done through the centuries, I believe, this is the best image of that moment of the Annunciation, the moment in which the Old Testament became the New, because it is correct in the manner in which it presents the theological, symbolic (semantic) and artistic truth of that instant in historic time (I thank freechristimages.org/index.htm for the clarity of Tanner’s painting). So it is at her birth that we have the road of our spiritual journey fork to the right. Mary’s decisions and actions allowed us to ultimately come to the point in our own life in which we, too, must make a decision. Mary shows us the way (as our Orthodox brothers and sisters would say – hodegetria) to Christ her Son, as she lovingly holds Him in her arms. The ancient sacred icon, that you see below, is the earliest image of the Blessed Mother holding the Christ child. It is found in the catacombs of Priscilla, on the Via Saleria in Rome, and is dated to circa AD 225. The sacred art of the early Church desired to express the beauty of the Scriptural truth. As you can see from the following two images – the first a Byzantine icon, and the second a painting by the great 13th century master painter – Duccio, from Siena, Italy. Duccio led a school of painters to infuse a strong sense of the humanity of Jesus and Mary into their figures. These images, and others like them, continue to have an impact on the hearts and minds of those who are open to their Truth. As simple human beings, and as Catholic artists, it is our delight to not only appreciate them, but, to venerate and delight in the Truth that they convey – all of which was made possible by the birth of a humble Hebrew teenager two thousand years ago. May she continue to show us the way. Wow! Thank you for introducing me to the Tanner painting. Stunning.